Today, I bought a brisket. Nothing says Barbeque to me louder than a beef brisket, wearing a thick coat of spices and occasionally mopped with a beer based sauce. Add some fried okra, cole slaw and pickles and yum, y’all. It helps to have a smoker, but it can be done on a grill or even in the oven. A smoker’s best, tho, in my opinion. Light a charcoal fire in your smoker or grill. While the charcoal is lighting, soak some smokers chip in water. Mesquite, any kind of fruitwood or hickory make a tasty and fragrant smoke. Rub the brisket all over with the dry mix. Really pack in on good, completely covering the meat on all sides. Set this aside. Mix in a small pot and set on low heat on the stove. If you’re making your brisket in an oven, add a splash of liquid smoke to the mop. Otherwise, leave it out, for it would be painfully redundant. 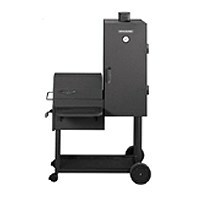 Set up your smoker accordnig to the directions, OR for a grill, set the fire up on one side on the grill. Wrap a few wet wood chunks in aluminum foil, very loosely, and set over the fire. Set the meat on the grill away from the fire, or in the smoker box, or in a dutch oven with 1/2 cup of beef broth. Bake in the oven, basting with the mop sauce every half hour or so, at 275 degrees. Whether in the smoker, grill, or oven, baste the meat with the sauce every 30-45 minutes, until the meat is done and very tender (3-4 hours for a 2-3 pound piece of meat). Cut into the meat and you will see a smoke ring- a red ring in the meat just under the surface. The wider the ring, the better it’s smoked. For a sauce to serve with it, take a 1/2 cup or whatever you have left of the mop, mix in a bottle of your favorite bbq sauce, and serve with the meat. Slice the meat across the grain, in thin slices, and dribble with the sauce. If you want. Really it’s pretty good without a sauce. Make sure there’s plenty of wood for the fire. I usually start the fire with charcoal, and then keep adding both wet and dry wood to keep the fire going. It takes about 15 pounds of wood to smoke for 8 hours. You can use charcoal to keep the heat up, just make sure it’s already lit and ashy before you dump it on the fire. Putting ‘raw’ charcoal will give your meat an unpleasant aftertaste, sort of a chemical flavor. If at all possible, stick with wood or hardwood lump charcoal. Under no circumstances should you EVER use lighter fluid. That stuff is a travesty. 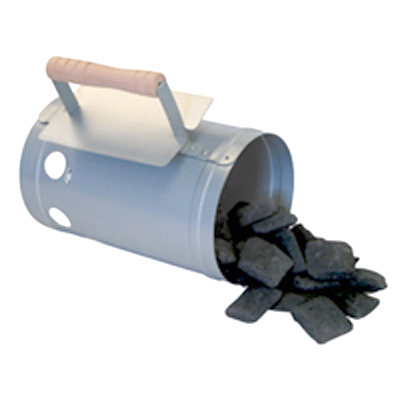 Invest in a charcoal chimney instead- they run about $10 at Walmart or your local hardware, and you can actually light your charcoal faster using a chimney than you can with lighter fluid. The only other thing you need with a chimney is some newspaper, paper sacks, or (this is what I use because I never have the other things) pinecones and dry leaves. I got the recipe for this from the Peppy Stepford Wife Herself, Sanda Lee of Semi-Homemade Cooking. Cheesy tablescape is purely optional. I have altered it a tiny bit, because I’m just that way. It throws together in no time, and you can keep the ingredients around to have it for an emergency meal. My people like it, but they’ll eat anything so I’m not so sure that’s a great endorsement. Mix together the vegetables and chicken. In a small bowl, combine the mayo, soy sauce, vinegar, and oil. Toss everything together and top with the noodles. You can also add those baby corn things, or water chestnuts, or whatever you like. You could use a can of bean spouts, a can of baby corn, and a can of water chestnuts, if you don’t want the peppers and celery that’s in the chop suey vegetable mix. Or, use frozen stir-fry vegetables, just give them a quick zap in the microwave. Mix the broccoli and onions together. Mix the mayo, vinegar, soy sauce, ramen seasoning, and sesame oil, to make the dressing. Stir the dressing into the vegetables. Immediately before serving, stir in the ramen noodles and top with the toasted almonds. If you mix the noodles in too soon, they’ll get mushy and weird. You can also top this with toasted sesame seeds instead of almonds. So, what’s you’re favorite summer salad recipe? Friday is our night to relax, have something fun for supper, maybe indulge in some alcohol based sin. One of our favorites is Grilled Pizza. You can make them over any kind of fire you want: gas, if you’re lazy like me, hardwood lump charcoal if you’re some sort of Bobby Flay wanna-be, or maybe even an EZ Light Bag o Kingsford. It’s simple really. refer downwards to the bread recipe. You can leave in the herbs or not. After the first rising, cut the dough into 4-6 pieces, depending on how big you want your pizzas. Pat and roll out to make a crust, and throw it on a medium-high temp grill. Count to 20, flip it over, and count to 10. That’s your crust. Smear the crust with ricotta, add the other stuff, and top with the cheese. I’m fond of this popular notion of not using red sauce on a pizza. I’ve never really liked the stuff, and ricotta or pesto make such a tasty alternative. Once the pizzas are assembled, make sure your grill is blazingly hot, but there’s a pizza sized spot that isn’t directly over the heat. Put your pizza there, close the lid, and count to 50. Check it, lifting it up to see the bottom. It the bottom is brown but the top isn’t as done as you’d like, stick it under the broiler for a minute. Other Friday Night foods include tacos, maybe a grilled steak salad, or one of my favorite summer meals: bread salad. I’ll put that recipe up in a couple of weeks. So- what do you like to fix, when it’s time to kick back and enjoy an evening? You know, those aromatic plants people grow in pots on their windowsill. I have the great good fortune of having a small plot of ground perfect for an herb garden, because a small pot just won’t do. I use them in everything. 2 quarts of water in a pot, add tea bags and mint and bring to a boil, then turn it off and let sit for a few minutes. Pour the tea in the pitcher, give a stir, and serve with plenty of ice. Mix it all together, and put it on anything from steamed baby vegetables to french bread or potatoes. You will learn soon that I really don’t measure anything. Unless otherwise noted, all quantities are approximate. Measuring just dirties up more things to wash.
Another thing Mom did right was to add summer savory to her bread. To this day, the aroma of summer savory makes me think of bread, and I absolutely love a tomato sandwich made with savory bread and homemade mayonnaise. Punch down, shape into a loaf, or rolls, or whatever shape you like, and let rise again for about 45 minutes. Bake at 375 degrees for 30 minutes, or until golden brown and sounds hollow when you thump it. Alternately: leave out the herbs, and after the first rising, roll it out into a rectangle. Brush with the garlic-herb butter from above, and roll up like a sweet roll. Then shape into a loaf and bake. Halfway through the baking, brush the loaf with some more of the garlic herb butter. So, what do you do with herbs? Fresh or dried, from the garden or from a jar…what’s your favorite? Come in and have a glass of tea, sit down and we’ll talk food for a bit. I’ve been cooking for a long time, since I was 9 years old when the very first thing I ever made was a batch of chocolate chip cookies, recipe on the back of the bag. Since then, I’ve cooked almost daily, as much as an act of self preservation as for pleasure. You see, my brother and I were born of eccentric parents. They are intelligent and creative people, but there were times when he and I craved a box of Kraft Macaroni and Cheese made with stick margarine and plain old milk, and were handed a bag of whole-wheat pasta and a chunk of hard goat cheese and told to make do. There were times when we wanted a peanut butter sandwich, just plain old Jif and concord grape jelly on white bread. Instead we got 3 day old whole grain bread (like sawdust it is, once it reaches that age), homemade peanut butter the consistancy of wood putty, and muscadine syrup that was supposed to have been jelly, but failed to gel. So, he and I, we learned to cook. And love it. So now, I am welcoming you into my kitchen, to swap recipes and yak about food. We don’t talk politics, religion, race, or sports (except when it’s related to tailgating). Everyone who eats or cooks is welcome!